Peace can only come to the world when the request of Our Lady of Fatima concerning Russia is exactly obeyed. Until that time Russia and its surrogates such as Cuba and Nicaragua will continue to foment "wars, revolutions and persecution of the Holy Father." There is no other alternative. Specifically, what must be done? The answer: Get Russia consecrated as soon as possible. The conversion of Mexico took place over the ten years after Our Lady appeared to the Aztec, Juan Diego, in 1531 at Guadalupe. This miraculous conversion of a whole nation saw some 10,000,000 Indians come to Our Lady's Shrine with Her Miraculous Image. As the pilgrim from the pagan religion came and saw the Miraculous Image, he was converted almost instantly, as he studied the picture of Our Lady, which was painted in Heaven. It took ten years for the Aztecs to come to Guadalupe shrine near the capital of the nation. It took that long for the word to spread and for all the Indians to find the time to come to the Shrine to see for themselves. But the Grace of conversion to the true Faith came very shortly after the pilgrim had come and made his act of homage to Our Lady. The conversion of Russia away from the 'Satanic State Religion of Marxism' (of Communism), will be seen to be a result of Our Lady's intervention on behalf of that poor, oppressed country. The Grace of conversion will also be sudden. 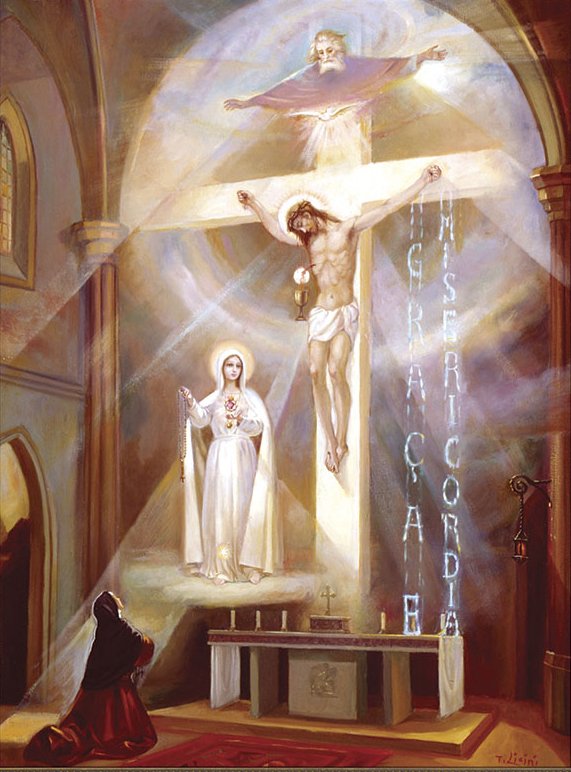 It will not take a very long time because Jesus, Himself, has told us, through the Message of Fatima, that the conversion of Russia will not come through a Miraculous Image of Our Lady and by the pilgrimage of the Russian people to a Marian Shrine, but, rather, it will come through the solemn public Act of Consecration of Russia to the Immaculate Heart of Mary by all the bishops of the world joining the Pope on one specific day. Just as the conversion of a handful of Aztecs before 1531, to the Catholic Faith, did not constitute the conversion of the Aztec nation; nor does the conversion of a few Russians constitute the conversion of Russia. Nevertheless, the conversion of Juan Diego before Our Lady appeared was part of Divine Providence's plans to bring about the conversion of the Aztec nation after Our Lady appeared to him at Guadalupe. So it may well be that the conversion of a few Russians to Catholicism now is part of God's preparations for the conversion of Russia, when the Pope and bishops finally obey the command of Our Lady of Fatima to Consecrate Russia in the manner prescribed by God. The conversion of Russia will be quick when it happens. Our Lord has said that the conversion of Russia will come about through the consecration of Russia by the Pope and bishops. The reason why Jesus gave this specific command to the Pope and bishops is because He wants His whole Church to recognize the consecration of Russia as a triumph of the Immaculate Heart of Mary. Now, Our Lady triumphs by converting sinful men away from slavery to Satan, to the service of Her Son. For Our Lady's triumph to be seen to be a result of this solemn and public act of consecration of Russia by the Pope and bishops----the conversion of Russia will have to follow virtually immediately for the Church at large to see that it was caused by the Fatima Act of Consecration of Russia by the Pope and the bishops. By what other means, exactly, God will bring about this sudden, miraculous conversion of Russia, we do not pretend to know. Just as no one foresaw that the Miraculous conversion of the Aztecs in 1530 was about to take place through a sacred picture of Our Lady. So, no one knows today, exactly how God will convert Russia after the Pope and the bishops obey Our Lady of Fatima. However, we do know that it will, in some way, be related to the Solemn Public Act of Consecration of Russia to The Immaculate Heart of Mary by the Pope and bishops. The conversion of Russia is not going to happen exactly like the conversion of Mexico because it will be through a one-time ceremony by the Pope and bishops. In this day of instant social communication, the minds of men are more prepared by God, through the means of the electronic age, to be able to receive a message throughout a whole society, much faster than the Aztecs of the 16th century were. So it is not impossible to conceive of the conversion of Russia to the Catholic Faith taking place very shortly after the Pope and the bishops obey the command of God addressed to them, through the Message of Fatima. But aside from these speculations about the future with the aid of the prophecies of Fatima to help us, we can assert, without fear of contradiction from any informed and trained Fatima researcher, that Russia will only be converted after the Pope and the bishops have obeyed this command which is their duty to fulfill. We can assert this without fear of error from Our Lady's and Our Lord's words to Sister Lucy on this subject. On June 13, 1929, Our Lady said, during Her most solemn appearance to Sister Lucy, "The moment has come for God to ask the Holy Father to make, in union with all the bishops of the world, the consecration of Russia to My Immaculate Heart. He promises to save Russia by this means." 'But My God' (Lucia answered), 'the Holy Father probably will not believe me, unless You, Yourself, move Him with a special inspiration.' 'THE HOLY FATHER' (OUR LORD ANSWERED), 'PRAY MUCH FOR THE HOLY FATHER. HE WILL DO IT BUT IT WILL BE LATE. Nevertheless, the Immaculate Heart of Mary will save Russia. It has been entrusted to Her'." For those who think that this solemn request of God and Our Lady can be or is changed by some new set of circumstances in the world, or by a later revelation to some other visionary, let us remember Our Lord's statement to Sister Lucy above. "HE (THE POPE) WILL DO IT BUT IT WILL BE LATE." On another occasion, Our Lord spoke to Sister Lucy. She records the conversation as follows: "LATER ON THROUGH AN INTIMATE COMMUNICATION, OUR LORD COMPLAINED: 'THEY HAVE NOT CHOSEN TO HEED MY REQUEST . . . AS THE KING OF FRANCE THEY WILL REGRET IT AND THEN WILL DO IT, BUT IT WILL BE LATE. RUSSIA WILL ALREADY HAVE SPREAD HER ERRORS THROUGHOUT THE WORLD, PROVOKING WARS AND PERSECUTIONS AGAINST THE CHURCH, THE HOLY FATHER WILL HAVE MUCH TO SUFFER'." So, in conclusion, peace will only come to the world through obedience to Our Lady of Fatima and Her solemn command to the Pope and bishops to consecrate Russia in the form prescribed. Thus, we can see that it is urgent for the proper fulfillment of the Fatima requests that this Vatican-Moscow agreement be widely known so that the Church can protect itself against it. It is only through the repudiation of this Vatican-Moscow agreement, that the Peace Plan of Our Lady of Fatima will be put into effect. So we urge you to once more petition your bishops and petition the Pope to fulfill this command of Our Lady of Fatima. 1. The Pope and bishops are duty bound to obey this order of Our Lady----as Father Joseph de Ste. Marie proved in our article published in Issue 9-10 pp. 9-10 of The Fatima Crusader.